To properly understand why it has such implications periodontal disease, which has, as a preliminary to wander a little anatomy.The tooth is embedded in the bone, “well”, Latin alveoli. There is relatively firmly anchored, but its fixedly held at a given location has a greater proportion of suspension system of the tooth.They are fibrous filaments that anchor the tooth surface and combine the tooth to the bone in the root of the tooth and the gums in the tooth neck. 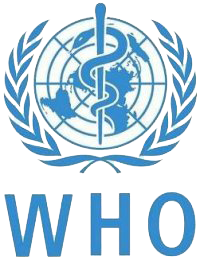 Collectively these fibers calledperiodontium, hence the name derived periodontal disease, periodontitis. These fibrils are also responsible for one in the tearing pain (extraction) tooth, because they are anchored to the tooth around very tight. It also how firmly holds the tooth in the bone and gum with the tooth, has a positive effect in that the surface of the tooth do not have a chance to penetrate the bacteria, food debris and other pathological materials that sensitive surface of the tooth, which is not the surface covered by enamel, as defensive barrier could excite. Therein lies the principle of periodontitis. Parodontosis and periodontitis are two terms that have some common features, but despite that differ from each other. Both terms can be called a common notion of periodontal diseases, which can be translated as a general disease pathology dissease. Periodontitis (inflammation of the suspensory apparatus) is an inflammation that has its location in the gums, lying close to the tooth and tends to spread towards the root of the tooth. Cause why such an inflammation develops, consists mainly of poor oral hygiene, the presence of tartar, defects in the bite and irritation prominent (or partially chipped) dental fillings, seals. Consequently, the resulting inflammation occurs to the connective filaments breaks, releasing the seal which until now hindered the entry of pathological organisms and food residues and they are here once free access. This creates so-called pathological trunk gums. You can imagine him as an elongated sleeve, which leads at the edge of the tooth, often relatively deep. It occurs therein for holding food, a further deposition of tartar and especially the propagation of bacteria, which have the opportunity to maintain a purulent inflammation of the supporting apparatus and gums. Hanging apparatus is gradually completely destroyed, partly declining and bone, occurs stripping tooth necks, later on, there will be a loosening of the teeth. It can start with either a “nod” in the worst case can even fall out. If impaired drainage of pus from the site of infection, there is a purulent abscess (bounded bearing inflammation, larger dimensions, which is full of pus). 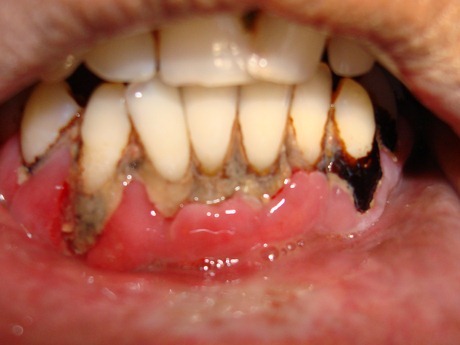 Periodontitis or juvenile periodontitis is also a disease in which the origin is unknown. So we can not say with precision what causes it. Disease begins as a supporting apparatus in which, as in the first case leads to its destruction (degeneration). Unlike the previous case, but they do not applyhere inflammatory effects. But the consequences are exactly the same, develops a trunk in the gum and the complications that were described in the previous paragraph are the same. Periodontitis is generally present in younger individuals, it is more common in women. Also occurs in people with high levels of hygiene! In the developed stage of both periodontal disease and periodontitis they look the same and practically can not be distinguished from one another. The largest complication developed stage is that it is absorbed (absorption) bone in which the tooth is anchored. The absorption occurs due to the inflammatory process. Many people also periodontitis or periodontitis erroneously confused in the event that they bleedwhen brushing your teeth gums. This phenomenon is not caused by a disease as serious as periodontitis. Bleeding is involved, for example, the wrong choice of toothbrush that is too hard, its fibers are too sharp or a person believes that the more you push the brush, the better your teeth cleaned. The opposite is true. Lots of people have bad hygiene habits, clean your teeth too short a time, so most of the plaque is not removed and remains trapped in between teeth, where at greater buildup can cause inflammation – for example, adjacent gums. The source of bleeding is then possible to search here. The greatest risk for developing periodontitis is a poor oral hygiene. It’s not enough teeth cleaned once a day or even twice a day, but a short time, I really wanted oral hygiene devote at least three minutes at each cleaning. For periodontitis as such cause is unknown, thus define its risk factors is impossible. Preventing periodontal disease may be very simple, so that one will pay attention to oral hygiene and regularly visiting your dentist. The dentist can intervene in time and refer your patient visit a specialist or call in time that is necessary to strengthen hygiene still, otherwise the development of periodontitis could occur in the near future. It’s also a good idea to change the toothbrush every three months, after three months because the fibers of the brush so promořena bacteria that whenever brushing your teeth in the oral cavity fills even more bacteria than they would get rid of them. It is also good to use brushes, which too will not damage the gums, i.e. soft fibers and the greater number of fibers, the better. For quality brushes that can be bought in pharmacies or your dentist is the number of fibers directly written. Another positive for election toothbrush cleaning pad is small, because only such a brush to get in the mouth really into all corners. Other good helpers in preventing inflammation in the oral cavity as interdental toothbrushes andinterdental thread that reliably removes food residue and plaque have been trapped in the space between the gum and tooth. As a dot for good oral hygiene will serve a quality mouthwash. They’re colorful. People usually seek a doctor until it’s too late. Often come up in the final state when the suspension system of the tooth is upset and fed up with “wobble”. Other symptoms may be that people complain about the retention of food in the interdental spaces, where they would normally functioning when the cap should be retained remnants of minimal or zero. For some individuals with bleeding may occur while brushing your teeth – but not because of the wrong choice of toothbrush and subsequent damage to the gums. Bleeding during periodontitis is much stronger. Clean, clean, clean. Efforts to maximum hygiene in the oral cavity, to avoid settling of the new bacteria in the trunk, so that inflammation if possible minimized. Because when bacteria will not have fertile soil and plenty of nutrients, their destructive behavior will not be so great. Next they will be recommended various gargle to rinse, for example based on chlorhexidine and the like. Cure periodontitis is not entirely impossible. But when the operating instructions of physicians can considerably delay the wrong end well for several years. Wrong end is meant the loss of teeth, the suspension apparatus is destroyed so that the tooth back in the bed will stick to itself and fall out. Today is also available Many preparations for hygiene during periodontitis or periodontitis, which are freely sold in pharmacies and some drugstores – whether special toothpastes, mouthwashes,creams. 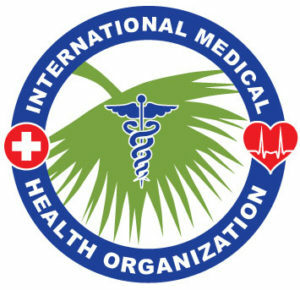 It’s good when you select some of them, consult with experts, surely we will recommend you the most suitable preparation. In the case that already developed periodontitis, instructions should always be experts, either from the medical or dental hygienists and increasingly take care of oral hygiene. It means the regular cleaning of the teeth, at least twice daily for at least three minutes each cleaning, ensuring the hygiene of the interdental spaces. It is good to provide interdental brushes or threads, which can safely clean the spaces between the teeth without injury to the gums. 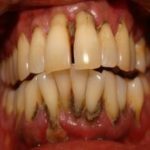 It is best to try to prevent periodontitis mainly because it will not allow her to erupt and oral hygiene, and I will take care automatically of course, not depending on the disease, which can arise from neglected hygiene. Dissease disease is annoying in itself. 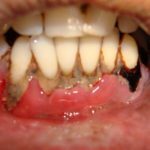 Bleeding when brushing your teeth, perhaps pain or halitosis are but a fraction of what during periodontitis or periodontal disease is imminent. The most serious complication, which they fear both physicians and patients is the loss of teeth.Loss of teeth both causes tooth loosening ligaments and also the absorption of the bone bed due to inflammation of the tooth. Unfortunately, as has already been written, if a disease breaks out, it is only a matter of time before it happens. But the attempt by the patient to the unfavorable end really a few years may delay.